(left) Michelle Yeoh, and (right) Jung Woo-Sung in Reign of Assassins. The Skinny: A solid and entertaining genre film with modern production values, old-school story details, and entertaining and well-developed characters. One of the best swordplay action films to come from Hong Kong/China in the past few years, and a terrific calling card for director Su Chao-Bin. How much credit does John Woo deserve? Honestly, we're not sure. The swordplay film gets a satisfying update with Reign of Assassins, an entertaining genre flick from writer-director Su Chao-Bin and his credited co-director, who goes by the name of John Woo (Yes, it's that John Woo!). An all-star affair with good action, a solid story, and most of all interesting and well-developed characters, Reign has obvious iconography and grand rivalries, and yet finds its joys in the most simple of things. The result is an elegant genre film that’s concerned mostly with its characters and their emotions, and yet still manages to delight, thrill and genuinely entertain. Reign of Assassins qualifies easily as one of the strongest, most enjoyable commercial films to come from China or Hong Kong in the last few years. When Reign begins, we’re introduced to Drizzle (Kelly Lin), member of assassin guild Dark Stone and master of the "Water Shedding Sword," a swordplay style that utilizes a flexible blade to flow and cut like water. Drizzle, along with comrades Lei Bin (Shawn Yue) and the Magician (Leon Dai), work for Wheel King (always excellent Wang Xueqi), with their main goal being the acquisition of the disemboweled corpse of deceased martial arts master Bodhi. It's said that whoever possesses Bodhi's complete corpse will rule the martial arts world so naturally everyone and their knife-wielding grandma is after Bodhi's halves. Drizzle and her compatriots actually find one half, murdering a court official and his son (Guo Xiaodong) to get it. However, Drizzle makes off with that half of Bodhi, leaving Wheel King and her former assassin allies in the lurch. Drizzle disappears but quietly resurfaces with a new name and a new face that resembles Michelle Yeoh's. Now called Zeng Jing, she lives a quiet, unassuming life as a cloth seller. However, instead of fending off assassins, Zeng Jing must contend with a nosy neighbor (Bau Hei-Jing) and dopey suitors, chief among them Jiang Ah-Sheng (Korean actor Jung Woo-Sung). Ah-Sheng is so enamored of Zeng Jing that he'll even take a beating from an overweight butcher if that's what she desires. 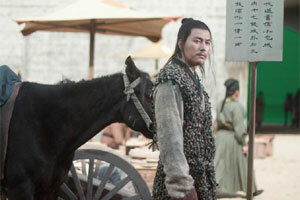 He seems like a complete tool, but something about his ardent loyalty quietly charms Zeng Jing. Meanwhile, Dark Stone continues its search for the Bodhi corpse, with one eye always on the lookout for Zeng Jing. Will Dark Stone find Zeng Jing and her new Yes, Madam visage? Will Zeng Jing give in to Ah-Sheng's charms? And who will possess the Bodhi corpse and, by extension, the power to terrorize jiang hu? The elephant in the room: how much of Reign of Assassins should be credited to John Woo? The answer isn't clear, though the prevailing impression is that this is Su Chao-Bin's show. The director's touch can easily be seen, as the film possesses a dark sense of humor and an attention to incidental, possibly needless detail that also characterized Su's 2007 horror-thriller effort Silk. And yet, it's those very details that make Su's work rich and intriguing. Expected focus is given to lead characters Zeng Jing and Ah-Sheng, but what's unexpected and quite entertaining is the attention paid to the Dark Stone assassins. The Magician is an aging, smug showman, while Lei Bin is a thoughtful, somewhat sardonic family man, and both Leon Dai and Shawn Yue get key character moments to shine. Meanwhile, new Dark Stone recruit Turquoise Ye (a very good Barbie Hsu) is a sexually-voracious sociopath who desires both money and men. And yet she's never a completely unsympathetic villain. Su makes all his characters distinct, and he does it with such economy (quick moments of interplay, maybe one or two focused character moments) that it's admirable. Nowhere is this truer than in the character of Wheel King. The "big bad" of the whole affair, Wheel King is after the supreme power offered by Bodhi's dead halves, but the reason why is a darkly entertaining subversion of current wuxia tropes. During the wild and wooly Hong Kong Cinema of the early 90s, it wasn't uncommon to feature off-color or tasteless details in swordplay films – and really, such content often reflected the source martial arts novels. In the Crouching Tiger, Hidden Dragon era, the swordplay film has largely been sanitized, made grand, elegant and sometimes sensual in a manner befitting global distribution. Reign of Assassins may look Crouching Tiger-like, but its roots are definitely old school, with some straightforward, even outlandish content mixed in with the revenge storylines and high-flying martial arts. Everything old can be new again, and Reign of Assassins demonstrates that entertainingly and amusingly. However, while Reign's content is old school, the presentation is most definitely up-to-date. The costumes, sets, cinematography and music are all Crouching Tiger (or at least Bodyguards and Assassins) level, with the sound design earning special notice for the bloops and blips that accompany Zeng Jing's Water Shedding Sword. The action isn't at the very top of the genre in that it sometimes lacks emotional or cinematic punch, but it's varied (each assassin has their own distinct weapon) and very much above par. Reign of Assassins is actually more memorable for the moments that occur before and between slashes and stabs, where the plot is turned or the characters are revealed. In many ways, it's Su Chao-Bin's storytelling that upstages the film's action. That may sound like an odd way to tell a martial arts story, but it’s skillfully accomplished here.